I swore then that if I ever shopped at a clothing store that had a scale at the checkout counter, it was time to put me in The Home. I think that time is coming. While walking through a mall the other day, I spotted a gigantic sign in a men’s store window that said “Clearance/70% Off/Come in NOW. I used to buy pants only when I needed them. Now I buy them when a giant store sign orders me to. This was one of those hip young men’s stores where the sales associates, who all look like Brad Pitt’s distant cousins, have to yell above the blaring dance music. I departed that target market years ago. As I entered, I half expected to see a bouncer at the front door checking IDs. “Sir, just keep walking. Sears is in the North Wing.” But 70% off is a powerful lure. So, I elbowed up alongside other much younger customers. 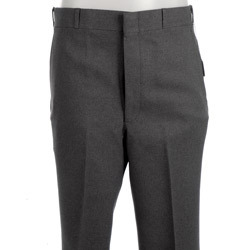 While they rifled through a pile of size 28 slacks, I stood alone at the normal-waist-size where I quickly found a pair in the correct length. Since the pants technically were my exact size, they should have fit me perfectly, right? No way. They were lacking in nether region space. Extremely lacking. In fact, the pants were apparently designed for men with no nethers at all. I wasn’t sure if I could sit comfortably in the slacks, or even walk in them. These days, lots of pants come in styles called Easy Fit, Relaxed Fit, and Classic Fit. They’re really talking about the crotch fit. Did I buy the pants? You bet. Seventy percent is a seventy percent, even though I had to walk with a limp. P.S. Get more of my writing, including free short stories, at Smashwords.